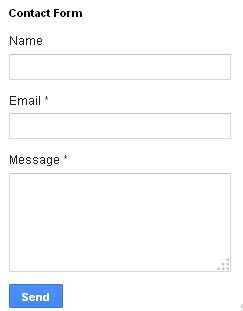 There are only 3 fields (boxes) - Name, Email and Message. At the popup, click MORE GADGETS on the left side, then select CONTACT FORM. Now whenever anyone submits the contact form, you will receive a message in your email INBOX (the email which you used as a username for your Blogger account). 1. create a contact form using Google Drive (Google Docs) then use the embed code to embed it into your blog. You are a life saver. I asked for help many times before of having sign-in or contact form and how to install that on my blog on blogger. I lost contact of people viewing my blogger because I have none, until now. Thank you, thank you really! Ok, I installed one, but I didn't like the way it looks, how can I change the background to look more like a form instead of missing pieces in between? Hi, thanks for the useful post. I have a question, in my blog when ever a clicked on any label , it redirects to some other url or adlfy link, I cant understand what to do. Please do help me, I will be thankful.